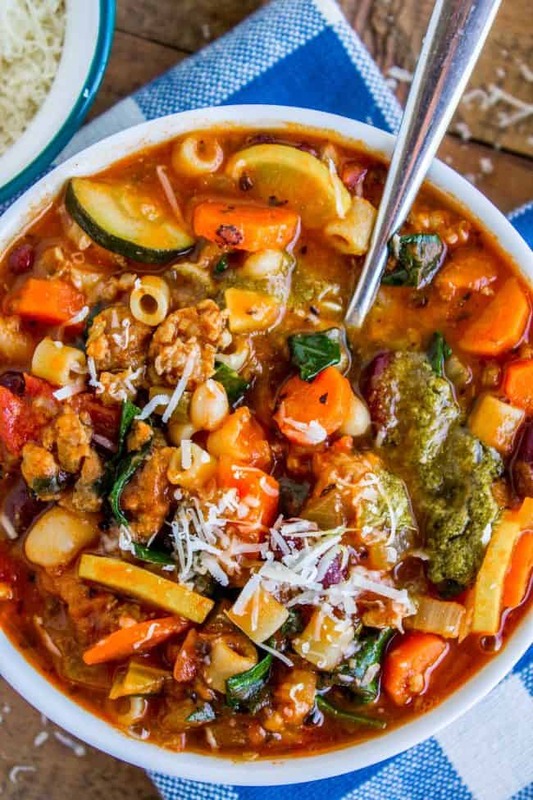 I always thought Minestrone soup was kind of boring, but then I added Italian sausage. And a spoonful of pesto. And topped it with parmesan. This soup is PACKED and I love it! Classic minestrone flavors, but enhanced. And tons of veggies so you feel super healthy. Did I mention you can make it in the slow cooker? Today I had a babysitter come over to watch little 16-month-old Valentine while I went to a Starbucks to work on this post. The mom guilt is killing me!! I know that’s ridiculous because I’m super lucky that I get to stay home with my kids, so I’m with them basically all the time. (ALL.THE.TIME.) I love having all that time! But sometimes I also hate having all that time. (insert crazy eyes here) Do you know what I mean? I’ve been feeling really unbalanced lately, and am trying to establish better routines so that I’m a happier, healthier mom/wife/human being. My normal routine is to stay up really late working on this blog. Like, reeeally late. Full time mom during the day, full time blogger at night! Who needs sleep! I’ve been on that schedule for almost 5 years now, and I thought it would be my body that gave out first. But I was wrong, it was my brain!! It went kablooie! You may have noticed that things have been quieter around here since Christmas…I’ve been posting a lot less. I love working on my blog and feel that it’s actually really important for me, so I’m not going anywhere! I just need to do some life-shifting to figure out how I’m going to cram it all in, because neglecting sleep is not going to work out anymore. 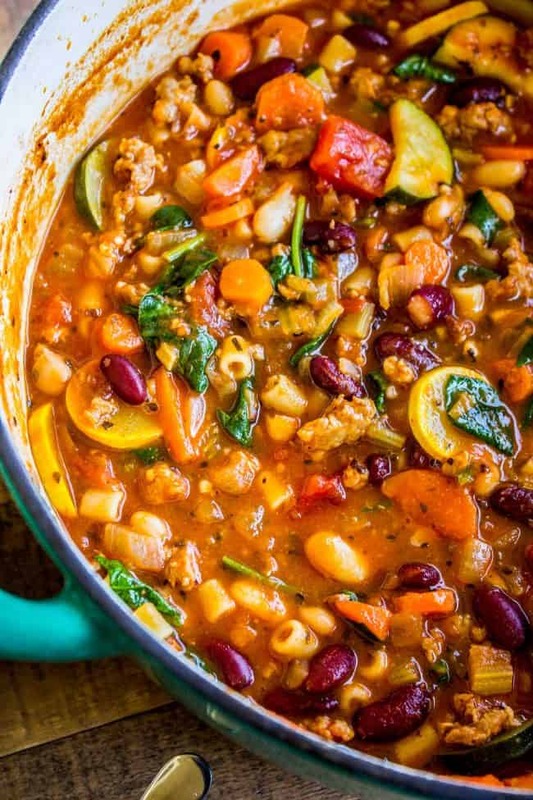 A few months ago I decided to try out a vegetarian chili recipe that I found in a cookbook. We all tried it and I kept thinking, something is missing. It just doesn’t taste five stars. Eric finally nailed it down… “I think it’s because you tried to make chili vegetarian, Karen. It’s not working.” Ha! I’m kind of a meathead. 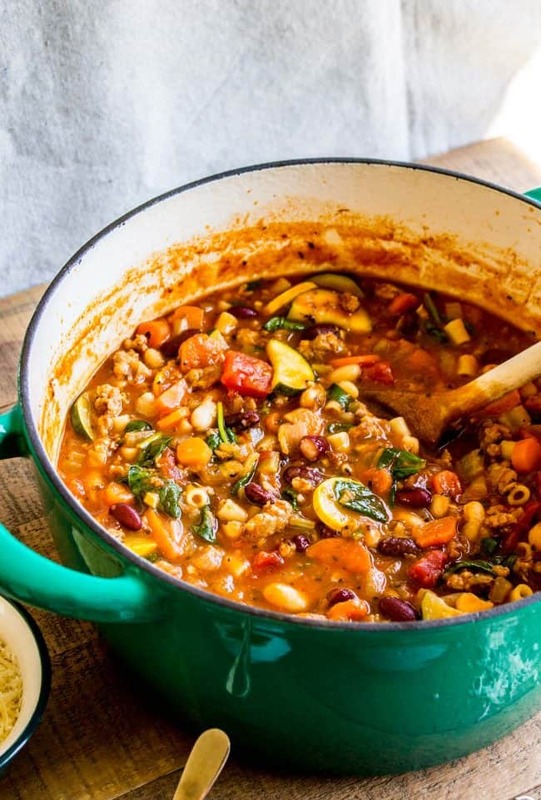 I’ve never really been interested in making minestrone (and I never order it in restaurants) because every time I eat it, I’m just like, where’s the flavor? Soggy vegetables in watery broth. And not enough noodles. No thanks. But THIS soup, guys. It’s amazing. 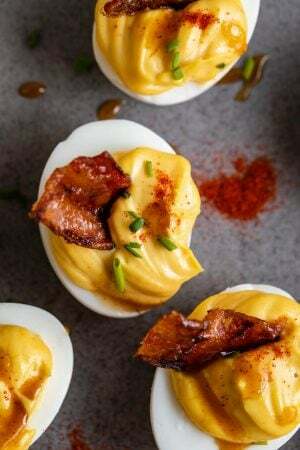 There is so much going on that every bite is like a party in your mouth. I’m never going back! My Aunt Shirley gave me this recipe. She is the BEST cook and baker. I have lots more recipes from her that I’m excited to share, but for now you can check out her Famous Dinner Rolls, Creamy Mashed Potatoes, and 10 Minute Caramel Popcorn. She is really the best for sharing it all with me (and you!) Thanks Shirley! The only way I think this soup could possibly get any better is if you added a parmesan rind to the soup while it’s cooking. Have you ever tried that? It would add yet another layer of flavor! I haven’t tried it yet but I want to next time. 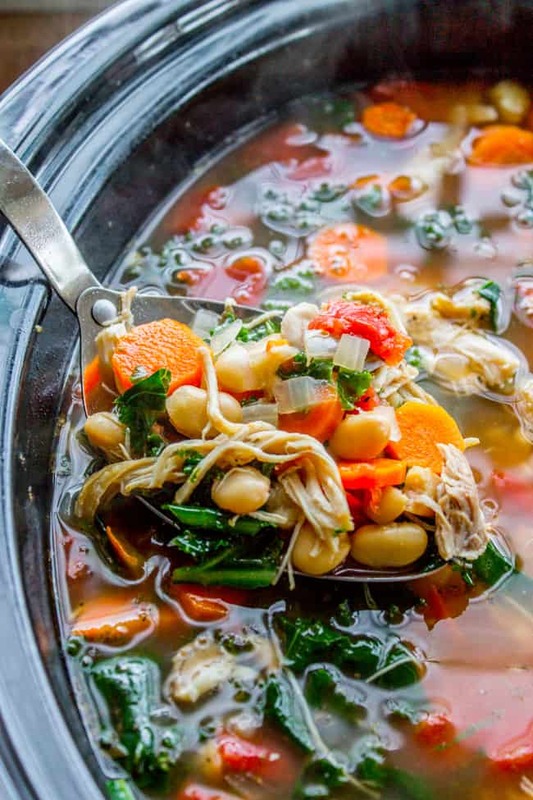 Parmesan rind is how you get such great flavor in this Kale, Chicken, and White Bean Soup (I also posted a slow cooker version). 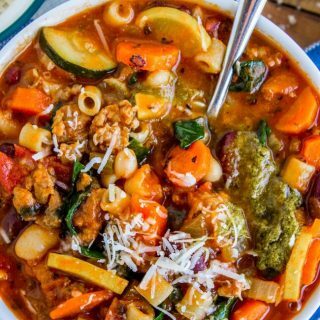 I always thought Minestrone soup was kind of boring, but then I added Italian sausage. And a spoonful of pesto. And topped it with parmesan. This soup is PACKED and I love it! 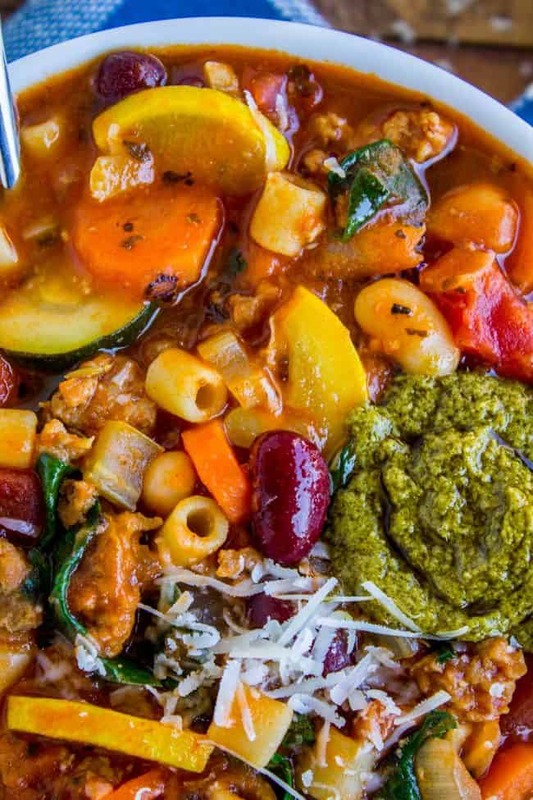 Classic minestrone flavors, but enhanced. And tons of veggies so you feel like you're on top of your life. Did I mention you can make it in the slow cooker? In a large soup pot, brown the Italian sausage over medium to medium-high heat. Drain the fat. Meanwhile, chop the onion, celery, carrots, and garlic. Add the tomato paste, onions, celery, carrots, garlic, and dried oregano. Add the can of Italian tomatoes and chicken broth. Turn the heat to high and bring to a boil. Reduce the heat to a simmer and cook for about 30-45 minutes, until all the carrots are tender. Add both cans of beans, the zucchini, yellow squash, and dry pasta. Bring to a boil, then reduce to a simmer. Simmer another 10 minutes, until the pasta is cooked. At this point, you can add another cup or two of chicken broth, if you feel like it's not "soupy" enough. Turn off the heat and stir in the baby spinach. I like to roughly chop mine so it's easier to eat, but you don't have to! Garnish each bowl with a teaspoon of pesto and a few grates of Parmesan cheese. Follow the instructions through step 4. Pour everything into the slow cooker, then add the tomatoes and chicken broth. Stir in the beans, zucchini, yellow squash, and pasta. Cover and turn the heat to high. Cook for about 10-15 minutes, until the pasta is al dente. Turn off the slow cooker. Stir in the spinach and cover another 2 minutes. Season with salt and pepper. *If you can't find Italian diced tomatoes, regular tomatoes will work fine! **sometimes called macaroni salad pasta. Any type of short pasta will work fine! 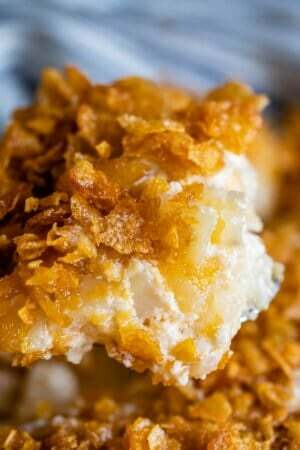 This is another gem of a recipe from my Aunt Shirley. Woman knows her way around the kitchen! 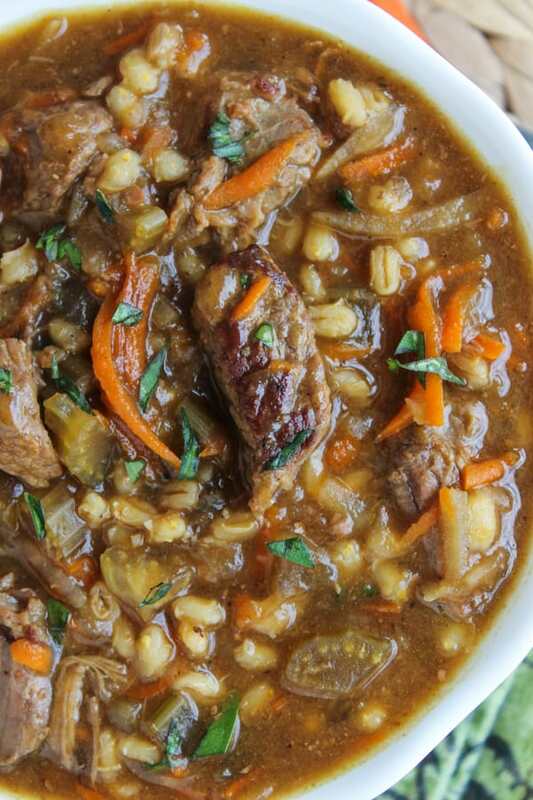 Slow Cooker Beef Barley Soup < this is one of the top recipes on my site! Recipe is from Eric’s grandmother. 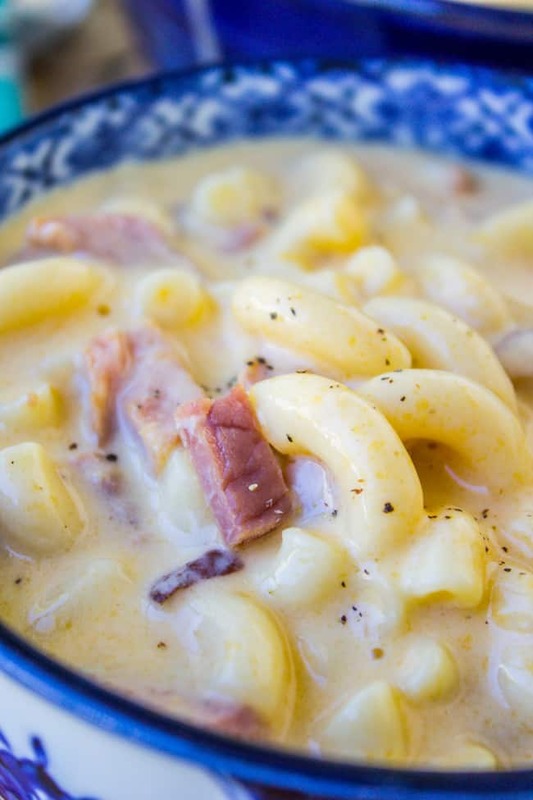 Ham and Mac and Cheese Soup << 30 minutes, tops. Kids love this. 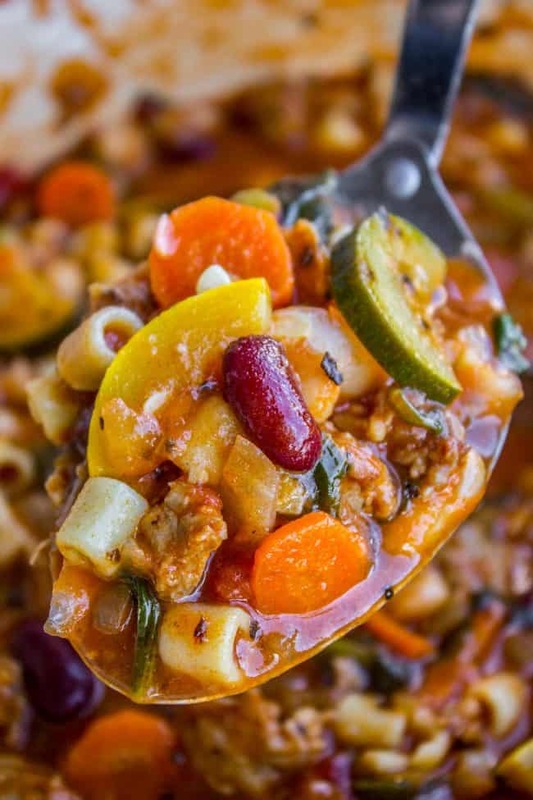 More minestrone from blogs I love! What a the new nutrition for the Minestrone Italian soup? Hi Leah, unfortunately I don’t provide nutrition info on my site, but you are welcome to plug the ingredients into an online calculator. The addition of sausage totally transforms this soup. I added a little butternut squash that needed using up and also half a red and half a yellow pepper that were sitting in the fridge. The soup was fabulous and I’ll be making this again and again! 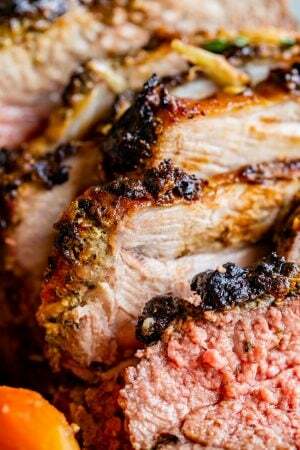 More slow cooker recipes like this pleeease! 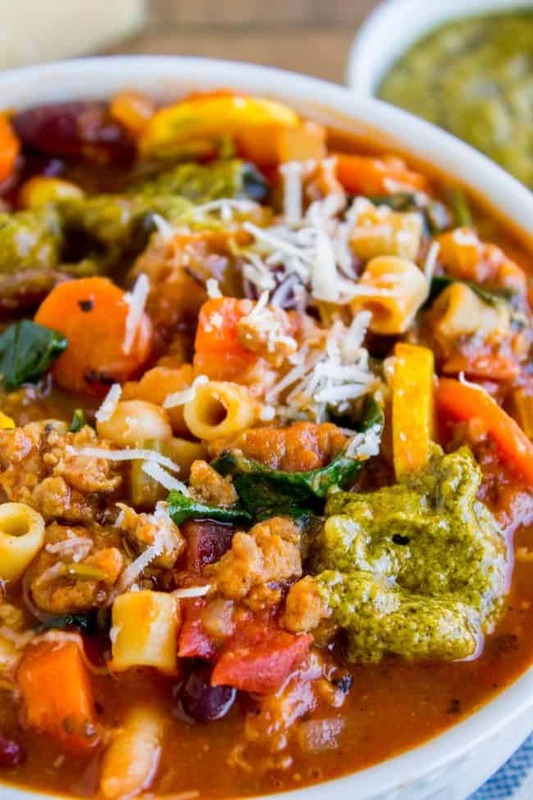 Minestrone Soup with Italian Sausage and Pesto – I made this recipe tonite and it is excellent – a keeper for sure. I used the stove top method. I added more garlic and another cup of stock – I got the “stew” texture but it is fantastic. Almost put my basil pesto back in the freezer because I didn’t think it needed it, but I decided to use it since the recipe called for it. I will certainly make this again, thanks for sharing the recipe and giving me another keeper for my recipe list! Top of the mountain awesome! i’m almost too old to get this excited ,HA I feel the one thing I used made a big difference… the Tuttorosso tomato paste & chopped tomatoes.They have a very smooth feel on the palette I think my Angel made choose them as i usually “just get the store brand” I do use Cheese rind & the Pesto was a new flavor for me in soup & last I used ground sweet Italian sausage. Top of the mountain! Ha I love that phrase :) And I disagree no one is EVER too old to get excited about food!! It’s just the best thing ever. I will definitely have to try the name brand tomato paste you mentioned, I bet it makes a difference! So glad you tried the cheese rind too. YUM! Thanks for stopping to leave a comment Liz! I’m so glad you liked it Katie! Thanks for the review! Looks delicious! Love the way you spiced it up. Thank you Barbara!! Pesto for the win! I’ve really been into soup lately, and this one looks delicious – my sister and my daughter are both awesome cooks, thanks ladies! You are so kind Mary! It’s true, I do feel like hibernating in the winter, and I live in California where winter hardly feels like winter! I’m going to try embracing more of this “good enough” you speak of. ;) Thank you so much for reaching out. It means so much to me. I know food blogs are supposed to be all about the recipes these days, but I still love sharing little pieces of my heart…and hearing from friends!